Megan Flød Johnson is a multidisciplinary theatre artist residing in MN. Please send inquiries to megannflod@gmail.com. 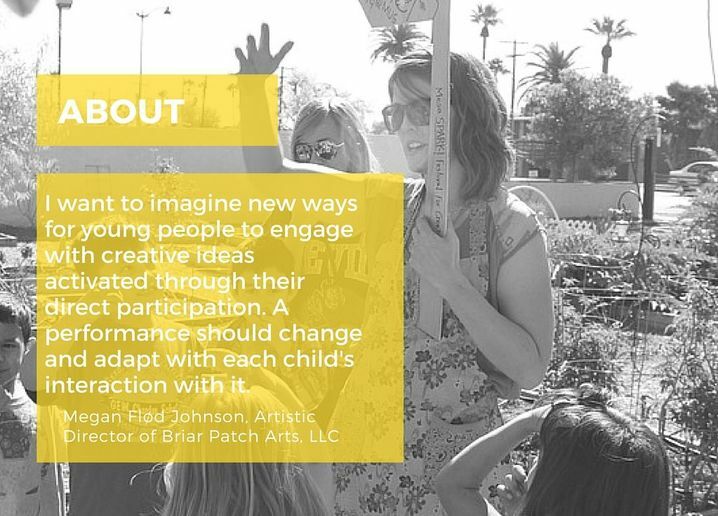 Megan Flød Johnson is a Theatre for Youth Artist who imagines new art experiences for young people that fuse inquiry-driven installation spaces with participatory performance. Megan believes that young people are makers and valued contributors to culture. She seeks to disrupt dominant narratives and expectations around performance and art-making experiences for young people to designate space for process, dialogue, experimental thinking, play and welcoming multiple points of view. Megan creates open-ended performance experiences where active participation is expected, is sensory-charged & reflects unique ways young people learn and understand the world- through play! Megan develops creative youth programming for museums, art centers and theatre companies around the country. Megan’s artistic work has been noted as possessing a highly visual aesthetic and her work got attention in the field including Special Recognition for the 2013 Don and Elizabeth Doyle Fellowship through the American Alliance for Theatre Educators. Megan is Director of Creative Learning at SteppingStone Theatre, a youth theatre in St. Paul, MN where she specializes in Theatre for the Very Young and early childhood programming. Megan holds an MFA in Theatre for Youth along and graduate certificate in Socially Engaged Practice from Arizona State University and BA's in Theatre and Classical Voice from Lawrence University in Appleton, WI. Read more about her work at meganflod.org.